A bear attack was reported near Bailey Canyon Wilderness Park on Monday, Oct. 10, 2016, according to the Sierra Madre Fire Department. 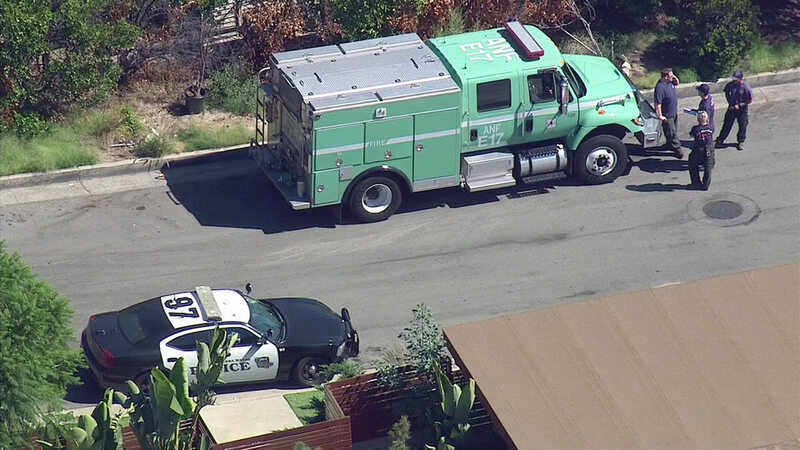 SIERRA MADRE, Calif. -- A man was taken to the hospital after being attacked by a bear east of Los Angeles, near the Bailey Canyon Wilderness Park area in Sierra Madre, on Monday. Sierra Madre police said the man was hiking about 2 to 3 miles up Mt. Wilson Trail when he encountered a brown bear on the trail at about 12:45 p.m. The victim, who was by himself, began to walk backwards from the bear after it stood on its hind legs, according to authorities. Police said while backing away from the bear, the hiker didn't notice a second bear to his left. The second bear attacked the man, knocking him to the ground, according to officials. The man was able to fight the bear off and the two bears ran away, police stated. The victim, who suffered a head injury and multiple cuts to his head, upper body, legs and feet, made his way down the trail and back to his home where he was able to call for help. He was taken to Methodist Hospital in Arcadia and was expected to survive his injuries. The California Department of Fish and Wildlife said the bears appeared to be fully grown, according to the victim's description of the animals. Authorities said a team was sweeping the area to see if the bears could be located. Fish and Wildlife officials stated they had swabs from the attack area and from the victim's clothing that would be used to help identify the bear that attacked the man. If the bear that attacked the man was captured, Fish and Wildlife officials said it would be euthanized. The Bailey Canyon and Mt. Wilson trails were closed until further notice due to the attack. While bears are spotted in the area often, police said they believed this was the first reported bear attack in Sierra Madre. The city of Sierra Madre and Fish and Wildlife officials stated there was no immediate danger to the Sierra Madre community.